"Learning to cultivate your life energies is the beginning of a way of life that is healing, illuminating, empowering and liberating"
"Hidden Secrets of Real Health"
Not signed up to receive our monthly updates yet? Energy Egg owners . .
"I had severe food reactions this week and used the Energy Egg with immediate results. If I didn't have it as a safety net, I don't think I'd eat or drink anything or venture outside of this room. . . . there's nothing on the planet like the Energy Egg for stopping my allergic reactions"
"On Tuesday evening I sat and watched television for about 1 hour - the first time for weeks - no problem. It was great. On Wednesday evening, I forgot my Energy Egg. After about 10 mins, I had to go out of the room - the sweat was pouring from me. So, from now on, I'll be carrying it in my pocket. Feeling great now - a million thanks again." "I can feel my head clearing - it’s like a fog lifting after all these years"
"I’ve felt a tremendous benefit and am feeling really good. I’m not reacting stressfully to difficult situations and my writing has tremendously improved. My doctor says I’m looking great, my energy is great and I feel so much lighter!" "Thank you so much for your loving and expert support. When I held the Energy Egg on my sternum I felt hooked up to a vital fuel tank and soon felt energized and relaxed . . . The Energy Eggs are brilliant!!!" "I cannot think what it was like now I have no asthma; it is wonderful: no medication whatsoever . . . after 22yrs [on Ventolin], to feel like this is great." "I have much more energy at home after a day working in a busy dental practice. I really noticed this after forgetting my Energy Egg on a few separate days. I was much more tired, even though I slept well"
"I've noticed that since I've been using my Energy Egg, I haven't missed a day of exercises - it seems to have eliminated the resistance that was reducing my resolve to do them before." "I misplaced my Energy Egg . . . and had a pretty miserable week. However, after a dream / vision on Friday night, I saw where the EEgg was and found it in the morning. How fantastic is that! I now feel so much better. I also view this as a lesson in how beneficial the Energy Egg is." 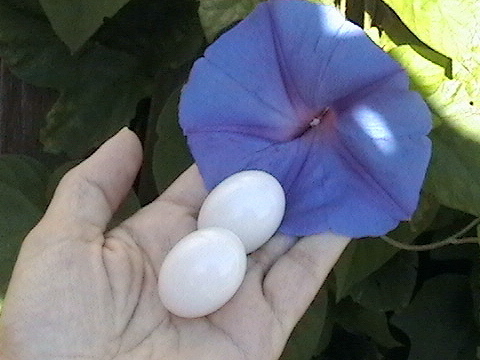 "I made a habit of re-tuning my Energy Egg to everything new that came into my home. Now I'm back to my usual energy [after six years of chronic fatigue]. Another positive effect of the Energy Egg has been much, much better sleep"
"My doctor says I'm looking great! thank you so much for the Energy Egg." "My energy is dramatically better. The Jade Energy Egg is doing great . . . I really appreciate it!" "I have good news to report. I have traveled to Japan (14 hours) with the Energy Egg in my pocket . . . I am happy to say that I arrived at my hotel, took a shower and went straight to the rehearsal. I am not experiencing the same horrendous jet lag. Also, I am normally allergic to Japanese food, due do their overuse of MSG. Now, before eating the food, I desensitise myself to it with the Energy Egg. I don’t get the same stomach burning and itch that I normally get." ". 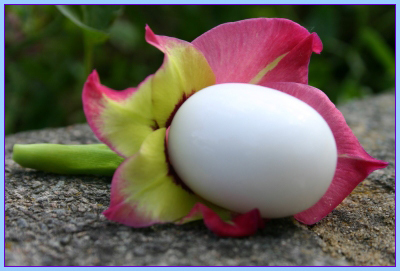 . . L lost her White Jade Energy Egg and noticed how her jet lag had gone and swollen legs on flights had gone whilst having the Egg. And that she has been on a process of self-discovery since buying it :) She has ordered a replacement..."
Why Do I Need An Energy Egg? The human energy or "qi" field is shaped like an egg. It is being attacked by many forms of natural and man-made environmental stress 24 hours a day. Your energy field repels and eliminates many of these energies itself. However, using your innate defence mechanisms against harmful environmental energies in this way costs you precious energy you can’t afford to lose. Also some environmental energies remain in your energy field and start to accumulate there, causing lesions or tears in your energy field. These energetic lesions or "chakra fractures" make you increasingly vulnerable to even more environmental stresses. The more environmental stress builds up in your body - eg. 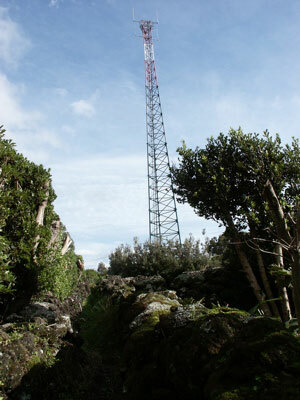 due to the electromagnetic pollution from a nearby mobile phome mast - the more it damages the life energies or forms of qi that control your health, wealth, happiness, relationships, creativity, awareness or any other area of your life. Frequent exposure to environmental stress is a primary cause of symptoms, diseases and relationship problems. Doctors in Germany discovered, many decades ago, that environmental stress not only causes illness but can also prevent you from responding to treatment. Unfortunately, due to lack of instrumentation, most forms of environmental stress are not yet recognised by Western science - in spite of millions of people experiencing their effects. Common sources include certain images, buildings, synthetic fabrics, shapes, electrical devices, computers, phones and mobile phone masts, underground water - even some cars generate more environmental stress than others! Today's wireless technology (wifi, wimax, wifi-mesh, etc.) is perhaps the most challenging of all man-made environmental stresses to deal with. "I connected my husband to his Energy Egg . . . then connected it to the Guardian Angel. I was waiting with slight trepidation when he came home from work yesterday as he has been so difficult to interact with lately. Anyway, he opened the front door and strode into the kitchen beaming and said, 'I worked without any stress bothering me today.' I couldn't believe it! . . .
Then my husband took me out to dinner and on the way he was telling me how he had been 'in the flow' all day, 'working like the old days,' etc.. . . . he works outdoors . . . it absolutely poured with rain the whole day and he got soaking wet and he still came home happy. The Energy Egg is charged with qi resonances (just as alcohol can be charged with the form of qi used in homeopathic medicine) by a Light Resonator. The Energy Egg’s shape echoes the shape of the human energy field, enabling the Energy Egg’s qi to benefit your entire energy field. This whole body energy protection is one of the fundamental differences between the Energy Egg and other energy protection devices which often only influence small areas of the human energy field. The Energy Egg has evolved over 27 years, from the original, electronic, Environmental Stress Eliminator to its current form. This deceptively simple qi transmitter emits a uniquely powerful energy that strengthens your body's natural ability to ground out stressful environmental energies. Unlike most other energy protection devices, the Energy Egg doesn't 'work' by hyper-stimulating your nervous system so you initially feel much better - even as new problems start developing - and even though you are still accumulating environmental stress. The Energy Egg is also, uniquely, constantly adapting to newly-encountered stresses - whether from new generations of mobile phones or new relationships if you are vulnerable to other peoples' energies. Another unique feature of the Guardian Energy Egg is its ability to eliminate environmental stress already in your body. Sha chi that hasn't been grounded out in the past accumulates in your body, displacing the qi (life energy) that should be there. This accumulation of stress is called your stress burden. The Guardian Energy Egg not only protects you from incoming environmental stress but, also, is the only product that steadily reduces the stress burden you have acquired over the years. Although the Guardian Energy Egg is purely an Environmental Stress Eliminator - and has no direct healing effect on the body - the reason why so many people say they experience beneficial side-effects through using the Energy Egg is that some of their problems result from their stress burden. Once the Guardian Energy Egg has eliminated an environmental stress, the problem it may have been causing ceases to occur. This effect can be very rapid or it may take months, depending on the location and depth of a particular stress in your energy field. However, if you have problems that are unrelated to environmental stress, the Guardian Energy Egg will have no effect on these. With the revolutionary Energy Egg, you can upgrade its environmental stress elimination power whenever you wish. If you ever notice the energy of any place, object or person affecting you, you can immediately re-tune your Energy Egg’s signal to take this influence into account. Click here to read how one Energy Egg owner, Margaret, instantly stopped an asthma attack - after walking into a store - by re-tuning her Energy Egg. Energy Egg owners regularly receive updates when there has been a major development with the Energy Egg. This is the only energy protection device that continues to develop the power and range of its stress-protective influence after you have received it. An Energy Egg - sitting at home on its transmitter - is also a perfect way to protect children from environmental stresses at school or anywhere else they spend time. and by licensed Energy Egg representatives. Life Energy Solutions from Energize Your Life Ltd.
"My daughter has just found my missing Energy Eggs under her sofa. I have been so exhausted without them and so happy to have them back!"